Halfway through the session, the Capitol's hallways are full of talk of a special session on school finance and property taxes. That won't happen — unless the Legislature makes a mess of the time it's got left. The hallway gossip and speculation in the Texas Capitol is about whether it will take a special session to accomplish anything on school finance, property taxes, teacher pay raises — all the big stuff. The conventional wisdom is that they’ll fall short. Don’t buy it. It’s crazy talk — even though the Legislature has backed itself into that very same corner so many times over the years. Except when it’s caused by something outside the government’s control, a special session is what happens when the Legislature fails to do its job, when leaders don’t lead, when the people who make it so profitable for others to sell whiskey and steaks in Austin forget what they were sent here to do. This year’s list of big things to do was not written by anyone outside the Capitol. The courts have done it before, but this time, state leaders — the governor, the lieutenant governor and the House speaker — wrote their own list of priorities. This legislative session passed its halfway point this week. It’s been quiet, relatively speaking, in a way that idles the folks in the halls and gives them time to speculate about how this lawmaking train will go off its rails. If it does, blame the people in charge. Sure, Texas legislators are handling the small and often goofy business they always do. In the last few days, the House passed bills that would force cities to stop over-regulation of children’s lemonade stands and to reveal how much they’re spending on big-time entertainers (like Enrique Iglesias) at civic events (in McAllen, the offender of the moment). The Senate, not to be outdone, passed a bill that allows restaurants to allow dogs to come to dine with their humans. But big stuff is moving now. On Monday, the House Appropriations Committee passed a state budget, the first major step on the session’s one truly obligatory duty. It will be up for a House vote next week. 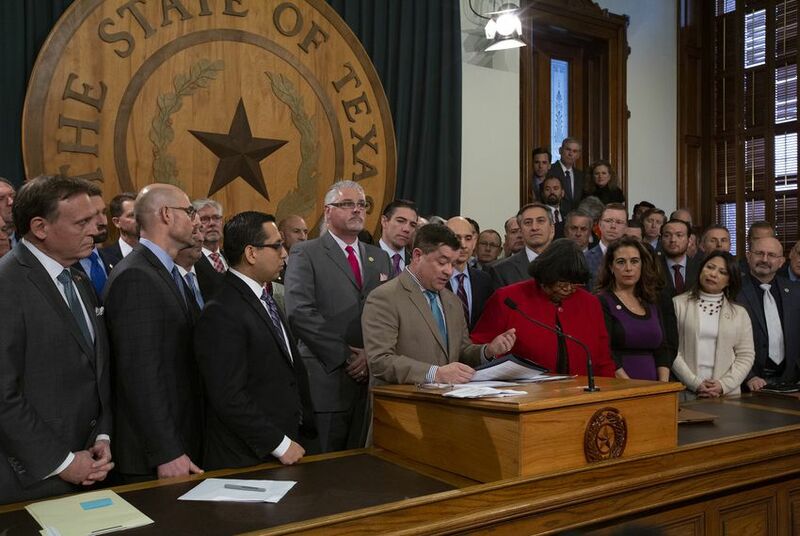 Related legislation that fills holes in the current budget, pays for some Hurricane Harvey relief, shores up teacher retirements and so on — all by taking money from the state’s economic stabilization fund — is also bound for the full House. A day later, the House Public Education Committee passed the fat (186 pages!) school finance bill, after removing a merit pay program that proved unpopular with teacher groups. And on Wednesday, Senators approved a set of bills prompted by the cleanup after Hurricane Harvey, with funding aimed at rebuilding and improving the responses to future storms like it. Earlier in the session, the Senate Property Tax Committee approved legislation that would require voter approval of any property tax revenue increase of more than 2.5 percent. That got stuck, apparently for lack of support, between the committee and the full Senate. Conversations are underway, as they say, with supporters and opponents trying to find a number other than 2.5 percent that works, or a process that works better than the prospect of triggering voter referenda every year. The House Ways & Means Committee hasn’t yet voted on its version, but has some of the same conversations going. And the Senate unanimously passed legislation approving across-the-board $5,000 annual pay raises for all public school teachers and librarians. That’s one of the lieutenant governor’s priorities; the governor and the speaker have committed to teacher pay raises, but not necessarily to that form or amount. So there’s a bit of sand in the gears, but the gears of state are turning. The biggest of the big items — a state budget, a school finance bill, teacher pay raises, and property tax reform — are all in motion as lawmakers pass the halfway point of the 20-week session. There’s also talk of a property tax cut that could be paired with that proposed limit on future property tax growth, financed by local or statewide increases in sales taxes. It won’t all pass, at least not in the form it’s in today. It might turn out that putting this package together might be beyond the abilities of this Legislature and the state’s top three leaders. But lawmakers have time. They know what their big goals are. It’s too early to let them off the hook, to say this game will have to go into overtime, even if lawmakers are operating at a time in American politics when voters seem to yawn at demonstrations of legislative incompetence. They still have more than 60 days left in this session; no reason to promise 30 more. Not yet.